We are this week introducing some exciting new features to Gold. As always, we anticipate that there might be a few early teething problems but, with your help and forbearance, we'll have everything bedded in by the end of the week, ready for the big races (King George, Goodwood, Galway) that follow. I don't know if you've noticed but there seems to be quite a lot of racing these days. Even race-to-race punters have their work cut out trying to keep tabs with the plethora of punting puzzles placed before them/us. So we thought - and it's thanks to Rory Delargy for the suggestion - we'd introduce some filters to help you cut to the chase, or the all weather sprint handicap, or whichever type of race you're particularly interested in. If you focus on sprint handicaps, just change the 'to' distance dropdown to 6f (or 7f or wherever your 'sprint' cutoff is) and ping the hcap switch on the right hand end. Voila! Sprint handicaps only. Only want the good stuff? No problem, change the 'to' dropdown under class to 3 (or 2 or 1) and presto, the good stuff. Changed your mind and want all of it? There's a reset link top right. Not interested in all of this newfangled convolution? Click 'hide filters' and they'll be gone forever. Or at least until you click 'show filters'. I appreciate these filters don't cover every eventuality: for instance, we could have differentiated for NH race type, or by age eligibility, or added presets for 'sprints', 'staying chases' and so on. But, you know, you can't please all the people all the time. Hopefully this is at least a step in the right direction, and perhaps just the ticket. 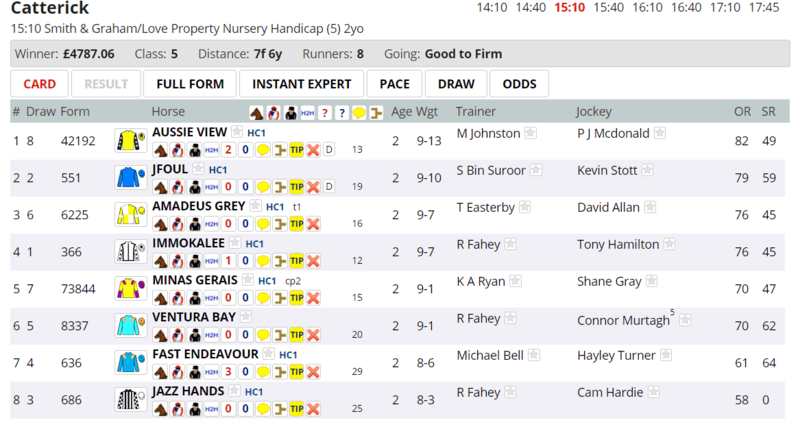 Settings are remembered, so if you only ever look at such races, they can be all you ever see in Geegeez Gold. Naturally, the power is entirely with you to flesh the shortlist out, or to abandon it altogether. And, importantly I think, the default is that the filters are hidden apart from the link to show them. Many users won't want such functionality and we don't feel the traditional presentation is especially broken, so in that regard we'll not try to fix it for those already happy. If you, like me, are a tinkerer, however, hit the show filters link and muck about a bit! In the example above, I've filitered by Class (1-5), by runners (8+) and by distance (5f-7f). I've also selected handicaps only. And hot diggity, there's my shortlist of three races - from a longlist of 42! - to go at. Uncluttered, no time investment to get there, just simply what you need without distraction. One other thing on views. Actually, on no views. We've added an option to hide the odds from the cards for those who like to form their opinions 'blind' to the market, as requested by Neil O'Connor. It's a really good way of not being influenced by other people and focusing on your own work; and I'd actually recommend to anyone with the time that reviewing one race a day in this manner will improve your judgement enormously. Remember to click UPDATE after making changes! Odds are also hidden on Instant Expert, Pace, and Odds tabs. They can be reinstated from the My Geegeez options. One more small change on the cards, this time to Instant Expert, where we've added in a draw column - it was requested by at least half a dozen users, so no names but thank you for the suggestion! That's pretty handy when you've established a probable draw bias and want to see which horses are otherwise best suited to conditions. 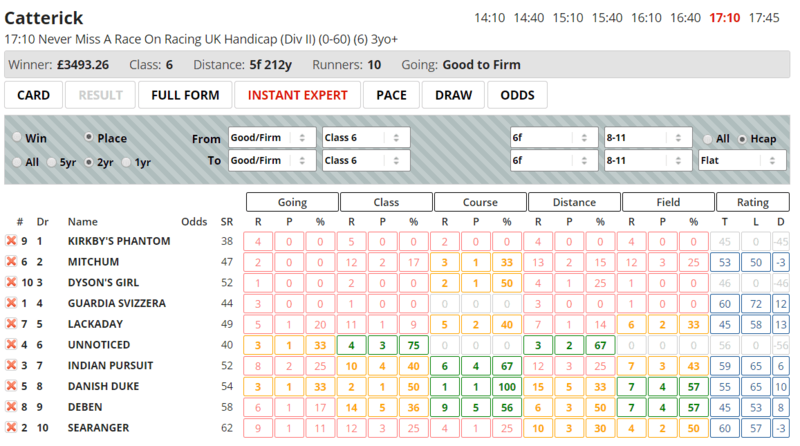 For example, there seems to be a low bias over six on fast ground at Catterick. In the 5.10 race, all the horses best suited to conditions are drawn high. With plenty of pace low, could this race be set for an upset? Reports are still reports, the data remains exactly the same, but... we've added a bell and a whistle. The bell is a little ^ dropdown on the left hand side which, when clicked, shows the line-by-line historical performance for a given report entry. Here's an example taken from the one year view on the Trainer Jockey Combo report today. Clicking the ^ (blue box, left side) reveals the historical performance data in the larger blue box below. Clicking anywhere in the actual R O'Brien-Chris Hayes row reveals their runner(s) today (green boxes). Simple, and even more illuminating than our reports already were! 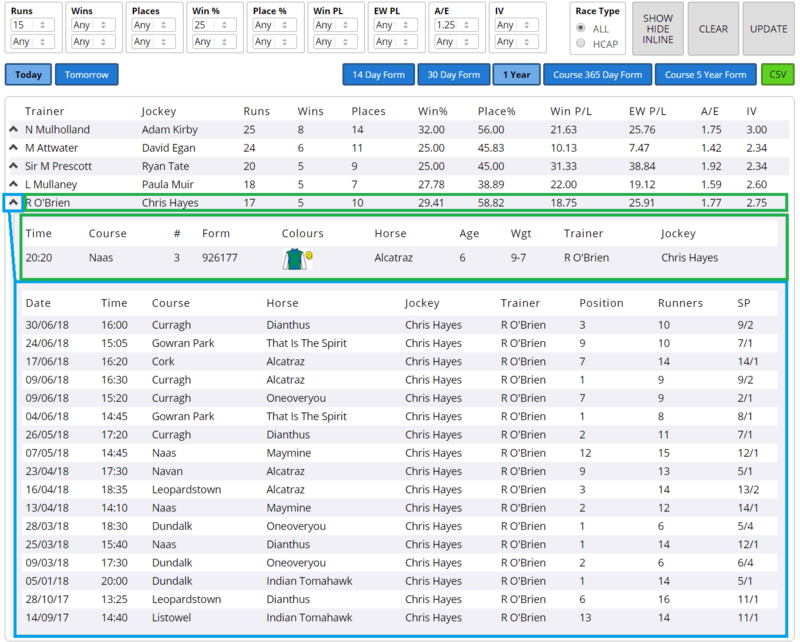 The left side of the data (columns A-K) show the overall performance on the report (in this case, Trainer/Jockey Combo), and the right side (columns L-V) shows details relating to the qualifiers for that given entity (e.g. that trainer and jockey combination, in this example). QT Angles: Could this permanently change the game for you? This piece of work has been difficult, and I don't think we're fully there yet; but we are in sufficiently good shape to let you have at it if you so wish. QT stands for Query Tool and it's our rudimentary analysis tool. 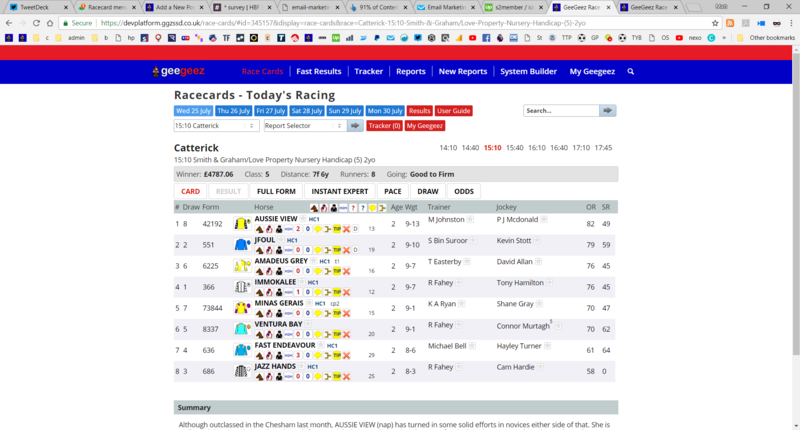 I say 'rudimentary', because there are more extensive options out there, like horseracebase.com for example, which is excellent. But I wanted to bring a user's work into his or her racecard display, front and centre. And that's where QT Angles comes in. In time, it could be the game changer. It's actually a three part piece, which starts - naturally enough - in the Query Tool. Once you've researched an angle - simple example below - you can save it as an Angle. Choose a name, and click 'Add Angle'. 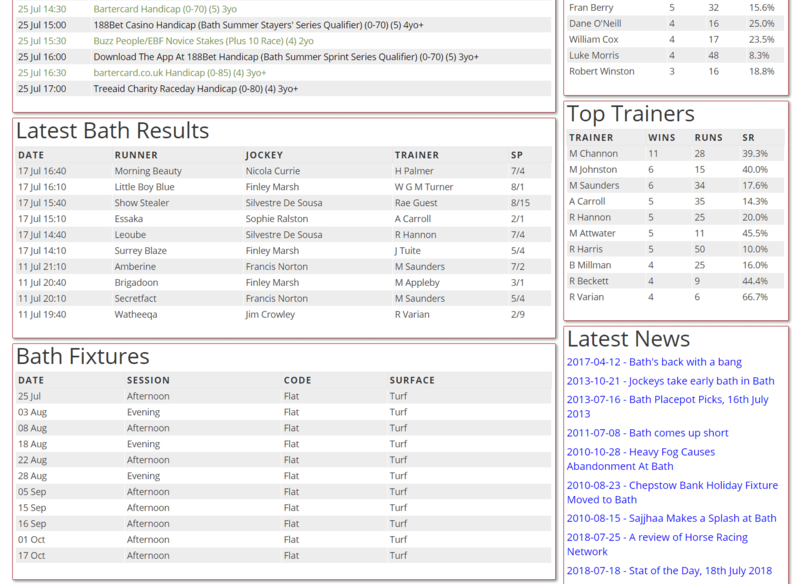 To view upcoming runners, click 'View Runners'. 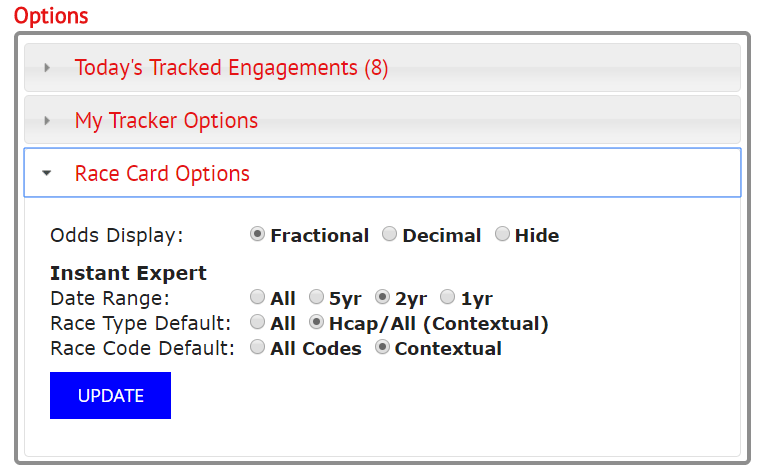 Once you are happy with a query, save it by adding a name and clicking Add Angle. View upcoming runners with the View Runners button. Step 4a - Check 'em out on the racecard (below is a work in progress). It's all very cool, and nearly there. We're going to do something which is largely frowned upon - normally for good reason - and introduce this in 'beta'. That means we know it's imperfect at this stage, but it is close enough to where we want it to allow you to play. More importantly, we need your feedback to iron out any remaining wrinkles. So do have a play if it's your kind of thing. These items will be rolling out over the next couple of days, so don't panic if you're a Gold user and can't see them right away. I will make an announcement on twitter - follow @geegeez_uk - when they've landed. I make no apology for the 'shouty' headline. Over the past few years, I've personally invested weeks of effort into creating a well referenced and comprehensive user guide for Geegeez Gold. It now runs to 99 pages. Importantly, it has a list of contents in the front from which you should very quickly be able to find the bit you need. Please please PLEASE look in there first before asking your question. If you don't, my customer service - which will always guide you to the relevant page - may occasionally be inflected with language betraying my exasperation! Geegeez is the best racing community in our lands precisely because we give you the wherewithal to support yourselves further than anyone else, and trust in your ability to do that. THE LATEST VERSION (v1.7) CAN BE DOWNLOADED HERE. If you're reading this page later than July 2018, do check My Geegeez for a potentially more current version. I don't believe in spoon-feeding, and I know you (mostly) don't want/need that. We're all about empowerment, through data and through support documentation and videos. On the latter point, I'll be doing some more videos, but my voice is suffering along with just about every other part of me just now, so I'm not exactly sure when. Very soon is my aim. Thanks for reading, and I hope you enjoy this next instalment of Geegeez Gold. p.s. if you're not a Gold'er and never have been, you can take a £1 month trial here. Former Gold subscribers may re-subscribe through the same link. Good luck! These last two will not be addressed this side of Goodwood. We have a nice stable version of the site just now, so let's not push our luck! I really hope you enjoy, and find utility, in these recent additions. If you find anything else, please do let us know. Thanks! 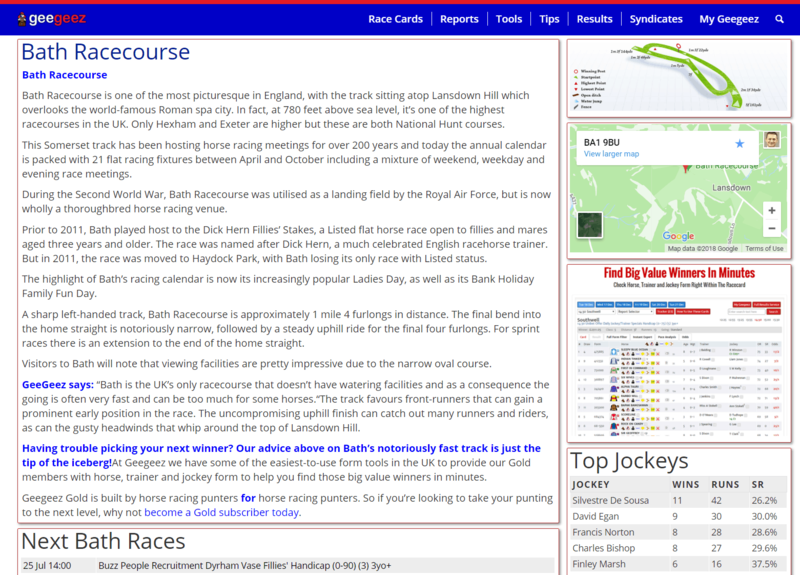 This is why I like Geegeez, it keeps “evolveing” without dropping the tried and tested, great work Matt and the team. Excellent Matt, keep up the good work. Great to see the upgrades. Racing web site wins by a significant distance…. GeeGeez first, the rest nowhere, to quote an old, but still relevant, racing saying. All very impressive! Can’t wait for these new features. The best racing website period! No filtering on NH between Chase and Hurdles? Afraid not, Chris. Not at this stage anyway. Addressed this in the post. The day has arrived. Things just got serious. I’m not seeing the filter option or racecourse summary when I log in. Is it live yet? Tomorrow (Thursday) morning, Paul. I think it’ll all be live by lunchtime Thursday. Don’t quote me on that, but it’ll be announced on twitter – and I’ll post a comment here too. Some really nice additions,to an already great site. Many thanks to you and your team Matt. Was looking forward to being able to save the QT angles, glad you’ve got it to a state where you’re happy to make it live. The other new features are great too. Thanks for all your hard work! Thanks Richard – good spot. I’ve passed that to my developers to look into. Thanks Richard – it’s clearly that variable which is not getting saved (Class). I’ve raised a ticket with my dev, and he’ll be checking ALL variables tomorrow and putting right any wrongs. Really appreciate you flagging this: it’s how we cleanse the glitches. There may be a few more yet, but we’ll definitely get there.